I apologize for the rather long note, and this may not be news to you, but I thought I'd summarize some things that have caught my attention the past few months. If you are ahead of the curve already, my hat's off to you. 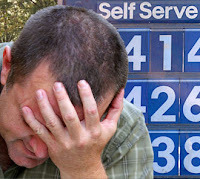 -You may (or may not) have heard rumblings in the press that gasoline will reach $4.00/gallon in the near future. -You also may have heard that even at current prices, folks are having to cut back spending in other areas to cover fuel costs. This, in turn, is not helping our economy that is already saddled with high consumer debt, low personal savings, and a slumping housing market. -You also may (or not) believe in Global Warming, i.e. Climate Change. While complex problems rarely have simple solutions, lately I have begun to get interested in things that can be done about them. Maybe not totally me, but all the 'mes' that make up America and use all this once cheap gas. I drive about 35-40 miles per day commuting round trip in mostly stop-n-go city driving conditions, and my 2002 Taurus is EPA estimated to get 18/25 mpg for city/hwy. I would tend to get about 250 miles per 12.5 gal tank for around 20 mpg. After pondering all these problems I began to wonder if there was a way that I could reduce the gas I was consuming, obviously with as little inconvenience as possible. I, like most people, do not like to be inconvenienced. I remembered seeing a portion of a t.v. show about a guy who could get over 100mpg out of his hybrid. I was reasonably skeptical at the time, but I remembered he said he had techniques to increase fuel economy for any type of vehicle. I began to do a little googling to see what I could find. I found 'Hypermiling', the study and practice of achieving higher than EPA estimated fuel economy for any vehicle. Hypermiling includes very basic and somewhat obvious techniques such as conservative acceleration and increased tire pressures...as well as some advanced maneuvers that allow even more savings. "Beating the EPA, the Why's and How's of Hypermiling"
Anyways, a 20%-30% decrease in fuel costs equates to several hundred dollars per year for me. 12.5 Gal/week @ $3 * 52 wks = about $1950/yr => 25% of $1950 = about $480. To some, 500 bucks may not seem like much over the course of a year, but keep in mind that the tax rebate checks they are sending out in a few months that are supposed to keep us out of recession are not much more than that...even before you get taxed on them next year...and before we all pay back the interest to the Chinese. If you start running the math for modest fuel economy increases for millions of drivers at even higher fuel costs...the savings for the country would quickly shoot into the billions, perhaps hundreds of billions. Now I'll be the first to admit there is no such thing as a free lunch. It is taking a bit of time and effort to study and implement these techniques. But just give 'em a shot for a tank or two. I found myself more in tune with the road, more alert to traffic, and actually less stressed. Surprisingly, since most of my driving is stop and go anyway, my commute time is nearly identical. You'd be amazed at how many people will quickly dart around you towards the next red light, just to have you coast right in behind them, just in time for the light to turn green. Maybe you already do all of these techniques naturally, and limit your driving to the bear minimum already. Perhaps I had a real 'lead foot' as they say, and maybe others wouldn't get the same results that I have so far...but I'd like to think I'm not too far off from the average driver. Perhaps it may be too much to ask for the 'ugly American' to turn off his SUV and walk in to McDonalds rather than idling in the drive-thru, or get off the cell and see that the light is red up ahead. But I'd still consider myself a proud 'ugly American' and I think given the proper motivation, we can do great things. So I'm asking you to give it a shot...maybe even log on to www.cleanmpg.com and graph your progress. Above all, just think about efficiency a bit and you'll naturally find some areas that are easy to correct.